Salon de Mercure bracelet by Dior in rubies and diamonds. Marqueterie cuff bracelet by Boucheron in chalcedony, mother-of-pearl and diamonds. There is no doubt about it, big bracelets are back: in these days of so-called austerity, more is more. For some years now, jewellery has been mirroring the way we shop: the acquisition of one or two very good life lasting pieces to be mixed in with fun high street buys. More than one fashion editor is to be seen on social media sporting an armful of pretty bracelets, Dior gold and diamonds stacked up with colourful holiday buys. The days of wearing a single golden filet on a delicately bronzed wrist have been replaced, in these days of so-called austerity, by the look of ‘more is more’. In the world of fine jewellery, this has resulted in the creation of spectacular statement bracelets- the elegant, restrained single line of diamonds is now supplanted by fantastical cuffs or strings of impeccably matched beads with beautiful gem set clasps. In terms of fine and high jewellery, although some of these pieces may cost the equivalent of a deposit on a flat in Kensington, they are far easier to wear. They transition from day to night seamlessly; a multicolour creation discreetly embellished with diamonds will look just as good with jeans and a Zara jacket as with a designer Little Black Dress. The same cannot be said for a diamond necklace or oversized chandelier earrings. My Green Cuff, by Chanel, in diamonds, tourmaline and malachite. Of course, large bracelets are nothing new- they have been an almost indispensable classic since Chanel teamed up with Verdura to create their famous cuffs. 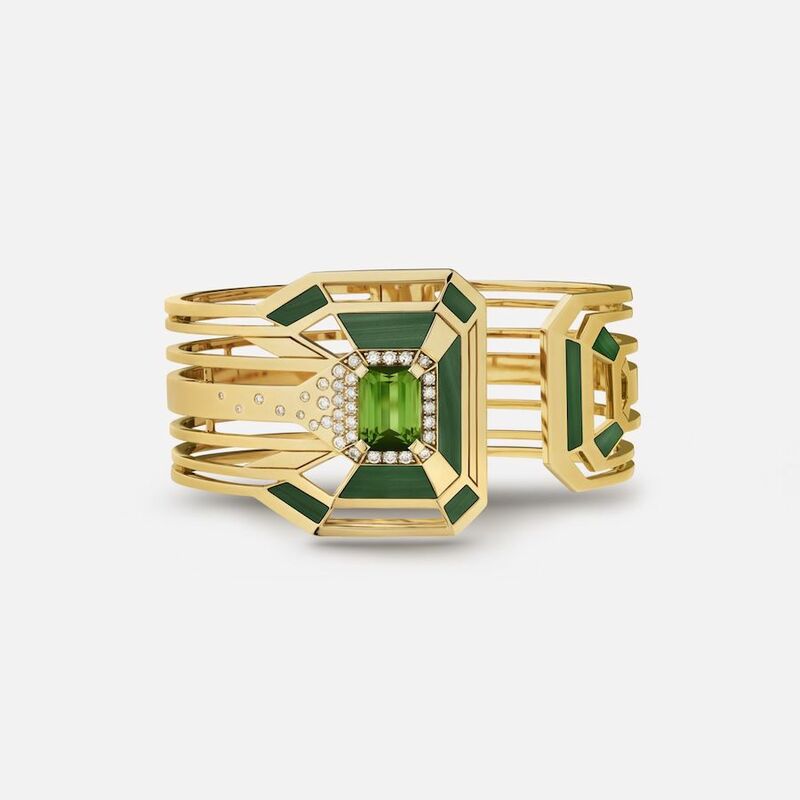 Today, one of their strongest designs is a piece called My Green Cuff, a strong structural design in malachite and tourmalines which evoques marquetry techniques. Speaking of marquetry, Boucheron have just launched a range precisely on that premise- their Marqueterie collection is a harmonious blend of greys and blues in chalcedony, mother of pearl and diamonds. The clean, geometric designs are a refreshing move from the jewelled bouquets and menageries of other jewellers. The cuff is genius, covered in small triangular stones which have all been precision cut to fit in with each other. Over at Dior, Victoire de Castellane offers a more neo-baroque approach with her Dior at Versailles collection, her irreverent juxtaposition of colour continuing to dominate the pieces. On the British front, Theo Fennell’s solid gold Palm bracelet is an instant classic that should not date. A lot of what is on offer borders on looking like costume jewellery- almost willing someone to look at the wearer and ask themselves ‘Is that really a £50,000 she’s wearing to lunch?’. It is a whimsical quality which I find fun and highly attractive in fine jewellery. 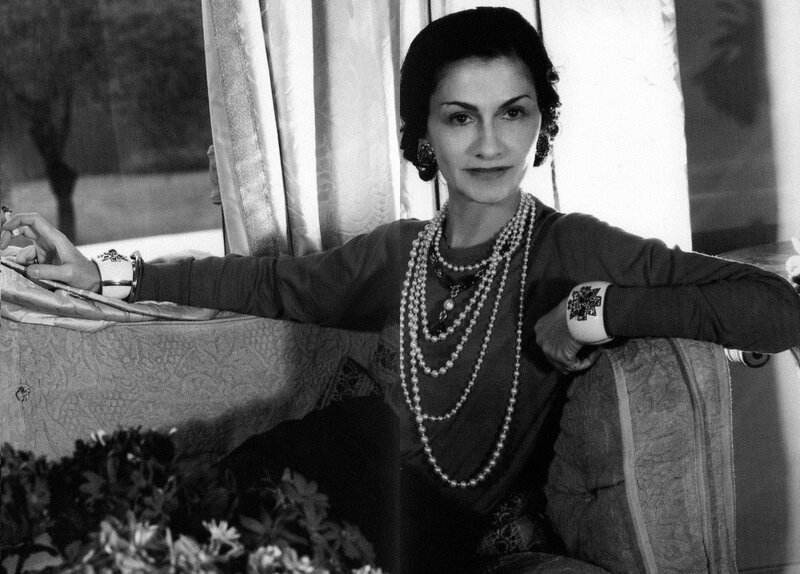 The Cuff Queen: Coco Chanel photographed in the ritz wearing her trademark pearls and Verdura cuffs.